Since summer is rapidly approaching (and since it never really ends in SoCal) I thought I should go looking for some gluten free ice cream options. In my search I found this -- a great chart that informs you as to what is and is not gluten free at Cold Stone Creamery! Baskin Robbins has listed here on its website the nutritional information of each of its ice creams. It's an unwieldy list, and when I went to click on "Allergens" they only had a column for Wheat, not Gluten. Definitely check ahead of time as to the ingredients if you are headed to Baskin Robbins. Unfortunately, at Ben & Jerry's, all I could find was this -- a listing of the company's ice cream with ingredients alongside. I wasn't able to find any allergen information on the company's site. 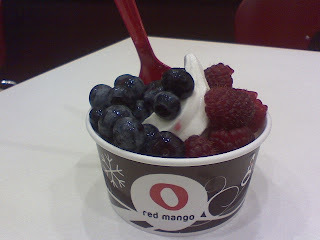 Another great, and lower calorie, option to beat the summer heat is Red Mango. On their nutritional information page here, they say that their yogurt is certified gluten free by the Gluten-Free Certification Organization. The page also explicitly warns of the possibility of cross-contamination with some of the chain's toppings. Cé Fiore, another low-cal yogurt option, is also certified gluten free, as stated here on the shop's website. I also found the following information here on Jamba Juice's, here. 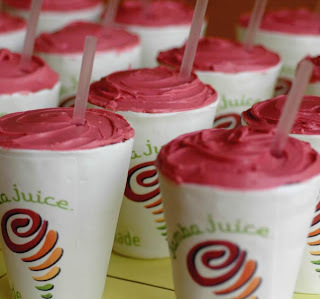 All smoothies are "non-gluten" except for Pomegranate Heart Happy. All boosts are non-gluten except for Daily Vitamin, Energy, and Heart Happy. Of course there is always my favorite place, Millions of Milkshakes in West Hollywood. See my previous post here! Excuse me but what about Robeks? Unfortunately I haven't been able to get definitive information from Robeks that their products are gluten free. Look for an update as soon as I receive confirmation!